Nurudeen Akorede, a 24-year-old technician turned robber, has blamed his ordeal on the spiritual influence by his stepmother. The father of two, who resides in the Alakuko area of Lagos, said he had lived decently until 2017 when his stepmother’s spell started manifesting negatively in his life. He said he started by smoking, through which he met some men who introduced him to a robbery gang, terrorising the Aboru area of the state and its environs. 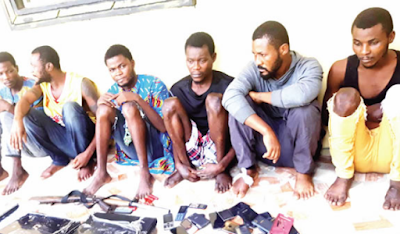 City Round learnt that Akorede and other members of his gang had raided houses in the community in January 2019, dispossessing residents of their valuables, including laptops, phones and cash. In the wake of the robbery attack, residents lived in fear as the robbers reportedly vowed to return to the community. Our correspondent learnt that operatives of the Inspector-General of Police Intelligence Response Team were detailed to track down the gang after the community alerted the police to the incident. The effort of the detectives paid off recently when the suspects were rounded up at different parts of the state. Apart from Akorede, other members of the gang arrested by the police are Kunle Akerele, Ayuba Aransi, Adewale Toyin, Oluwatosin Adeyemi and Tunde Yusuf. Two locally-made guns, 60 mobile phones and 30 laptops were reportedly recovered from the suspects. Speaking to City Round during the week, Akorede said his life made an about-face after his parents separated and his father remarried. The native of Abeokuta in Ogun State claimed that his father’s new wife afflicted him with spiritual problems that made him to become an armed robber. He said, “I fix aluminium doors and windows before I joined the robbery gang. My trouble started when my parents separated. I was in secondary school when they separated and my mother took me with her while my younger brother was with my father. After I finished from secondary school education, I went to learn how to fix aluminium doors and windows. My father’s new wife started tormenting me spiritually. She made my younger brother to go insane and she also poisoned my father. Akorede said he participated in four operations with the gang, including the raid on houses in Aboru – the last he was involved in before his arrest. He said his role was to stay outside and watch out for policemen, noting that he got N20,000 share from their last operation. Akerele, 29, who hails from Ekiti State, said he went into crime because of joblessness. He said Akorede initiated the robbery, adding that he (Akerele) bought a gun for N20,000. He said, “Akorede linked me up with one Peter who took us to the areas where we robbed people. I approached one Yusuf, who lives in my area, and gave him N20,000 to buy me a gun. One of our members called Tunde also has a gun. He has not been arrested. Yusuf, 33, said he joined the gang after he was sacked at a clubhouse in Ikeja, where he worked as a barman. The indigene of Ilorin, Kwara State, admitted that he helped Akerele buy the gun he used for operations. Aransi, a cobbler with two children, stated that he got N35,000 share from the proceeds of the two operations he participated in. One of the receivers of the items stolen by the gang, Adewale Toyin, was also arrested by the police. 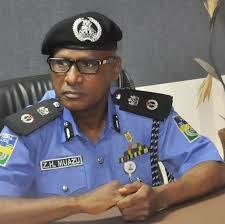 The 42-year-old man from Esan, Edo State, stated that he had received about 60 phones from the suspects so far.